Filming the 40s and Going Vintage At Shuttleworth! 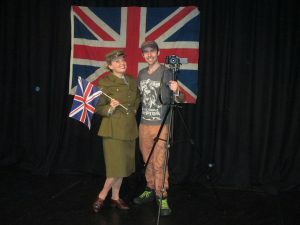 If you caught my last blog you will know it’s been all go this week as I took to the Limelight stage in Aylesbury to film the next episode in my series of musical showreels. 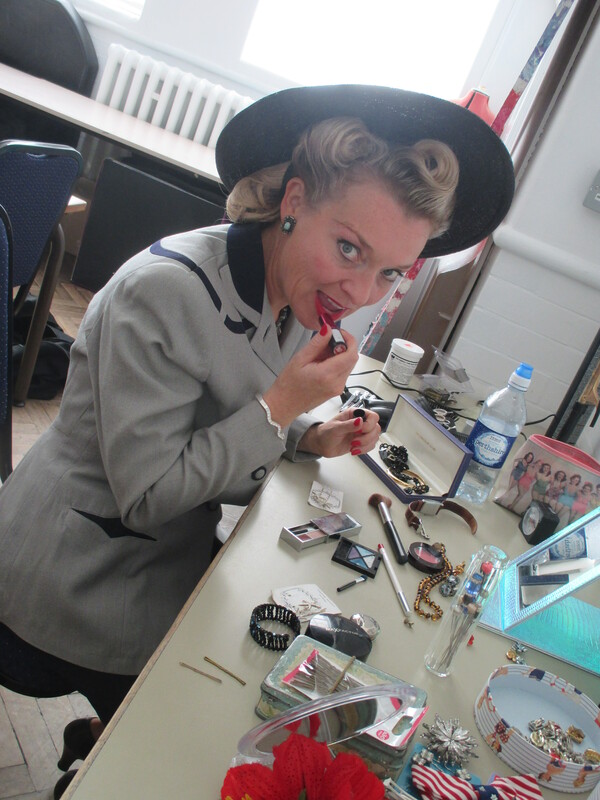 This week I’ve been concentrating on the music of the 1940s. 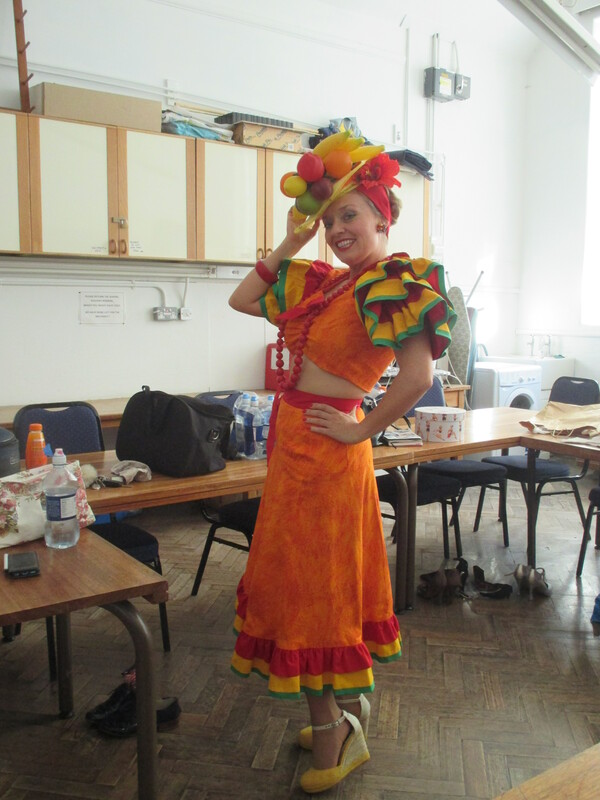 A great deal of thought, time and money goes into all my costumes and for this film I designed two new outfits to go with the American number “GI Jive” and the Carmen Miranda classic “I like you Very Much”. Dressed to do Carmen Miranda! Miranda costume which is made up of four cotton fabrics and is piped in a beautiful emerald green. 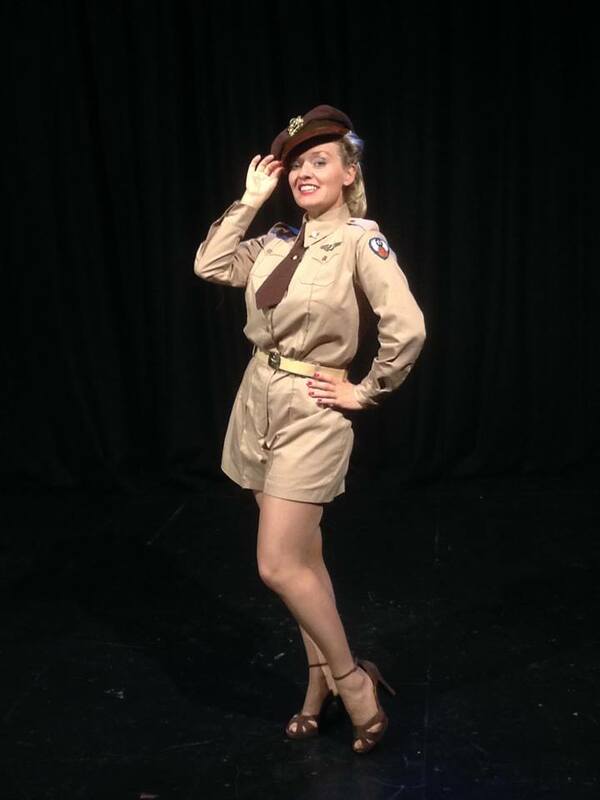 It’s the piping which takes all the time and I’ve also had all my military creases sewn into my GI Jive costume which took it’s inspiration from the 1940s pin up Bugle Girl. This week Kim has been working with me on set not only as my sound engineer but as my hair dresser as well. She took some great back stage footage of me performing a few of my numbers on her mobile phone which I would love to share with you all. Unfortunately I have no idea how to share it across as a message to my Facebook page so I guess you will have to take my word for it and wait to see the proper video when it’s done. Me in My GI Jive Costume! will give the showreel great colour and variety. If you click through to my facebook pages you will be able to see all my photos and costumes. In the meantime you will be able to see me this Sunday performing 3 x 30 minute shows daily at the Shuttleworth Museum, Old Warden, Biggleswade, Beds, SG18 9EP. This weekend the museum will be opening it’s doors for a Heritage weekend and I’ve been engaged to perform songs from the 1920s through to the 60s before the flying displays take place. My show times are as follow 9.30am – 10.00am 1920s and 30s, 10.30am – 11.00am 1940s, and for my final set I shall be performing songs from the swinging 1950s and 60s at 1.15pm – 1.45pm. So I hope you can all make it along.